Back in October, we were invited to speak on the hot topic! that is immigration as part of La Casita Cultural Center’s Hispanic Heritage Month activities. Rebecca Fuentes, organizer at the Workers’ Center of CNY spoke alongside our friend and colleague Carly Fox from Worker Justice Center of NY, and immigration lawyers Alex Galvez and José Pérez. Several of our volunteers and members contributed at the information table by distributing WCCNY literature and getting signatures for the dairy workers campaign petition. Organizer and Advocates Rebecca and Carly, focused on discussing the immigration problems they come across on a daily basis when out on the fields with farm workers and the many other industries that immigrant workers become involved in when moving to this country. Advocates and lawyers expressed their knowledge regarding the recent changes in the deferred action policy, deportation issues, workers compensation, discrimination, abuses and harassment, among other sub-topics. The panelists engaged the audience members by discussing the topic in an inviting manner. 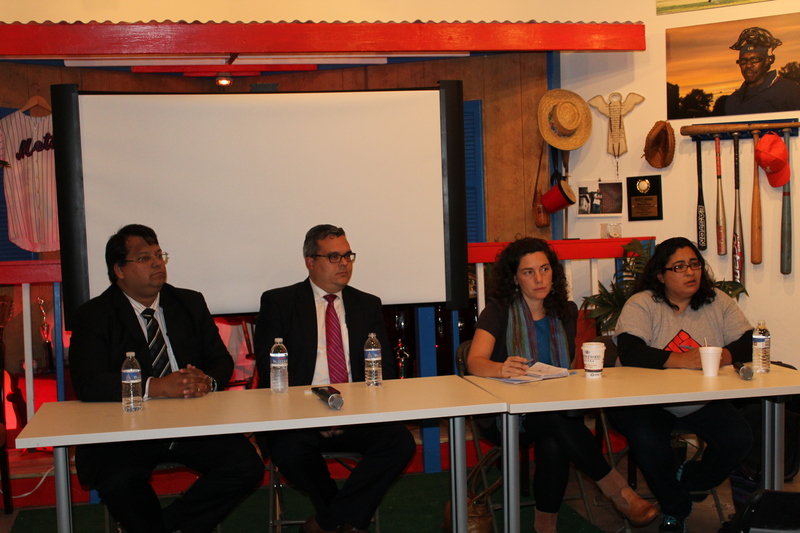 Panelists explained many of the issues that immigrants face when arriving to this country, and issues that children of immigrant parents confront throughout their childhood years. The majority of the audience members expressed wonder and sympathy at the comments and dialogues that the panelists were speaking about. Audience members were pretty responsive to the panelists discussion and had many questions for the panelists throughout and after the panel. We want to thank La Casita Cultural Center for opening their doors to the Workers’ Center of CNY and the Worker Justice Center of NY so we could engage in this important conversation at such critical times. We would also like to thank the audience for their questions and willingness to learn, and to the volunteers and members for dedicating their time and putting effort to represent the organization. Thank you to our members and volunteers for helping to facilitate the information table.